Narakasura (Naraka the demon) was a vicious tyrant who subdued the gods, brought away their tusked elephants, sixteen thousand maidens and jewels from the earrings of the God-Mother. The chief of gods approached Krishna for help. Kishna with his wife, rode Garuda (the eagle) and went over obstacles of water, fire and wind to Narkasura's city-gate guarded by a five-headed demon. 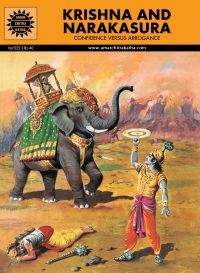 With his whirling wheel-discus and piercing arrows, Krishna killed the guard and other demons and finally Narakasura himself. This is the story of why the first of four days of Diwali - the Festival of Lights is named after Naraka!